2. The catalog does not list Hilgen's first production model, the "HM-B." 4. The catalog does not include two additional models that Hilgen had reportedly offered in 1965 but were later dropped: the T-2512 "Star" and T-2513 "Galaxie." I have never seen an image of either model. The Internet contains no statement by anyone who claims to have seen or owned a "Star." 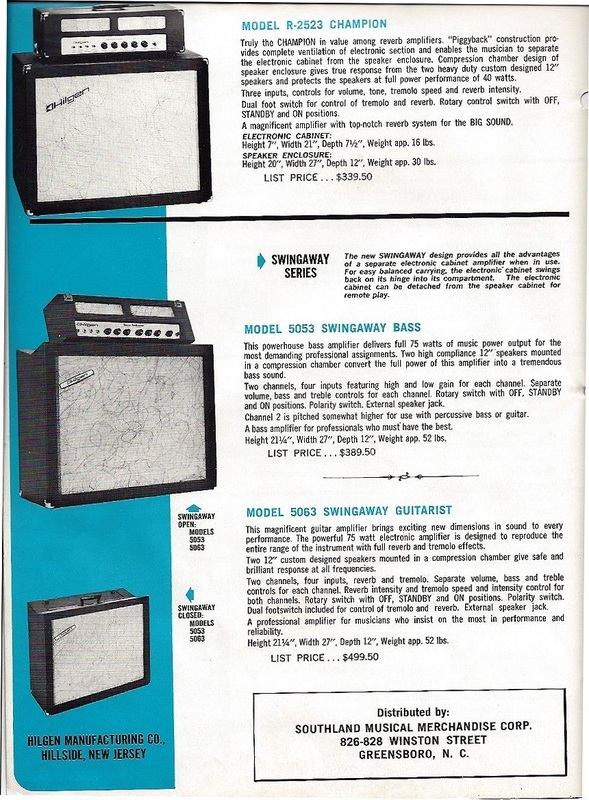 Nonetheless, the Vintage Guitar Price Guide lists both models (without pictures), describing the "Star" as a 25-watt tremolo combo amp, and the "Galaxie" as a 25-watt piggy-back style tremolo amp with two 12" speakers in the cab. On August 31, 2013, I received a form entry to this site from a person who reported owning a T-2513 "Galaxie." I am seeking confirmation of the report. 5. As you probably gathered from the previous note, the letter prefixes for the model numbers did have meanings. All bass amp models begin with "B". All guitar amp models equipped with reverb have the prefix "R;"however, every amp that had reverb also had tremolo. 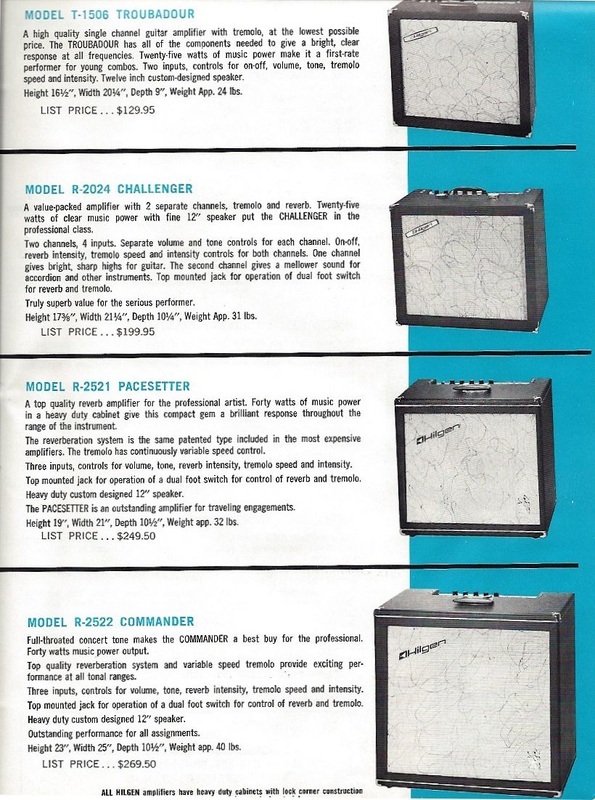 A few amps only had tremolo; those model numbers had the prefix "T." The only exceptions to the above were the HM-B and the two Swingaway models, 5053 (bass) and 5063 (guitar). Some amplifiers also have the suffix "D." Those are amplifiers that Hilgen originally built as one-channel amps but to which it later added a second channel. 6. The wattages reported for the amplifiers are "peak power," as was common in the 60's. Because "peak power" denotes the maximum amount of power an amplifier can possibly handle for an instant without damage, it exaggerates by about 30% the amplification power produced under typical operating conditions. In 1974 the Federal Trade Commission issued a rule requiring that amplification be expressed as "continuous" or "RMS" power, which basically represents the maximum output of the amplifier before total harmonic distortion exceeds 2%. The rule is found at 16 CFR Part 432. It's interesting if you are a geek. To convert peak power to approximate RMS power, multiply the peak power figure by .707. 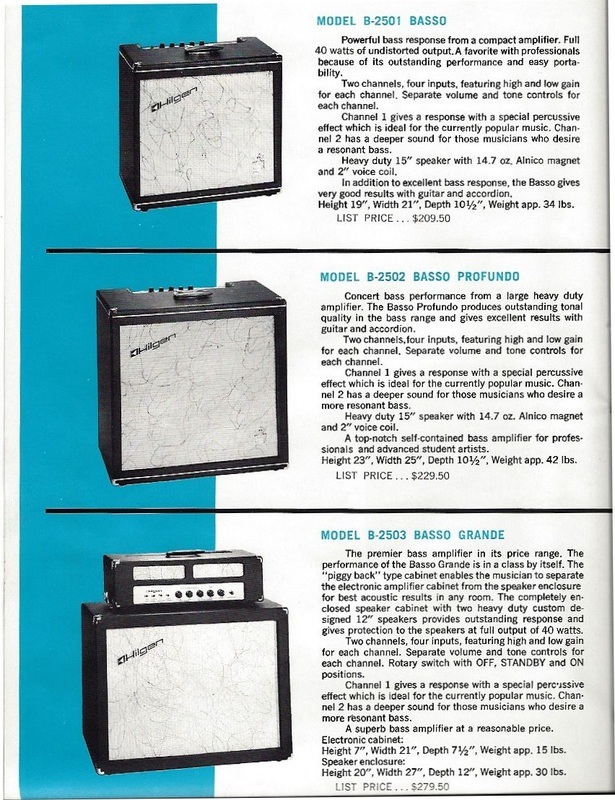 Thus the Hilgen guitar amps ranged from about 18 watts RMS for the Troubador and Challenger to 53 watts RMS for the most powerful of the line, the Swingaway. 7. That this catalog dates from 1966 is only an inference, based upon (a) the disparity between it and the August, 1965 price list, (b) indications in the 1966 catalog that the range of models was still in flux, and (c) as explained in the following note, anachronisms and other oddities in the 1966 catalog that reference a model line predating the August 1965 price list. The catalog was included in a distributor's catalog that contains advertisements that are dated mid-1966. 8. 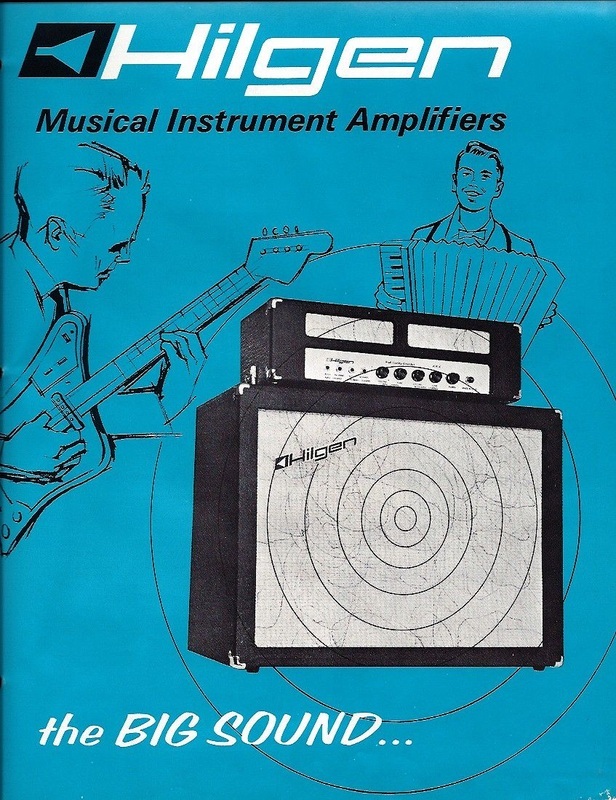 Based on the piggy-back design and number of inputs and knobs, the amplifier depicted on the front cover of the 1966 catalog can be only one of two alternatives: the B-2503 Basso Grande, or the R-2523 Champion. However, if one has seen an HM-B in the flesh, it is clear that the model information on the faceplate of the amplifier is that of the HM-B. In the middle are the words "High Quality Amplifier;" to the right are the initials "HM-B." 9. If one looks closely, whoever designed the catalog used one image for all the combo models, and simply adjusted the apparent size of the cabinets and reversed the images to make them appear different. The swirls on the grill cloth are simply reversed in every other photo. That is amusing in a way, but it falsely creates an appearance of uniformity that never existed. Some had piping, others did not. Most had a Hilgen badge in the upper left corner of the baffle board, and some bass amps had a brass coat of arms hammered into the lower right corner of the baffle board, but -- contrary to what the catalog shows -- very few models had both. Remarkably, I have never seen any two Hilgen grill cloth patterns match. When I purchased a Basso Grande cabinet from which the speakers had been removed, I had the opportunity to examine the grill cloth closely, with illumination from both sides. As hard as it is to believe, I am forced to conclude, from that inspection and others, that artists actually painted or inked the swirl patterns uniquely onto each square foot of grill cloth ever produced. The patterns never repeat. In fact, when we get to the Basso Grande model, I will photograph a piece of grill cloth that, in my opinion, rises to the level of a work of serious art -- like the embroidery on a Japanese priest's robe.